Resource Insights: Has OPEC misled us about the size of its oil reserves? Does it matter? Has OPEC misled us about the size of its oil reserves? Does it matter? This is the second of a six-part series introducing readers of The Christian Science Monitor to concepts useful in understanding the Resource Insights blog. Selected posts from Resource Insights will begin to appear on the Monitor's Energy Voices blog this week. Click here to read the first part of this series. The next question we should ask is: Does it matter? The answer is most definitely yes. OPEC, short for the Organization of Petroleum Exporting Countries, currently claims that its 12 members hold 81.3 percent of the world's oil reserves. And, with few exceptions the world believes them. Trouble is these reserves "are not verified by independent auditors," according to a study (PDF) done by the U.S. Government Accountability Office, the nonpartisan investigative arm of the U.S. Congress. OPEC reserves are simply self-reported by each country. Essentially, OPEC's members are asking us to take their word for it. But should we? Those so-called silver bullets don't return a workable EROEI. Many are simply wishful thinking and don't hold up to the laws of thermodynamics. No suppression has been necessary because of the above reasons; they suppress themselves. I find your blog to be very sane and informative, 2 rare qualities these days. Excuse me for reprinting the whole thing, but the article below appeared in my inbox today. He calls Peak Oil a hoax, but then acknowledges that oil won't last forever. I am curious if you have any comments. I've written many times over the past decade that I consider Peak Oil to be one of the greatest intellectual frauds ever perpetrated. I believe having a correct understanding of these issues is critical… perhaps the single most important economic issue of the next several decades. This matters because if M. King Hubbert (the original Peak Oil theorist) was right in 1956 when he forecast global oil production would peak around the year 2000… we're facing a major change in the future of the energy industry. If we're actually about to run out of oil, or if production is inevitably going to decline, we ought to be making major investments in alternative sources of energy, like windmills and solar farms – even if those technologies are terribly expensive. Likewise, if we're really about to run out of oil, spending huge sums of capital to dig up most of Alberta (for oil sands) and mandating electric cars might be sensible policies. Investors face an even more basic question: If oil production is inevitably doomed to recede, isn't the future price of oil likely to be drastically higher? On the other hand, if M. King Hubbert is wrong (and I believe he was catastrophically, even laughably, wrong), perhaps we're wasting billions of dollars in capital pursuing energy solutions that aren't practical, economic, or… in the case of photovoltaic semiconductor (PV) solar… physically possible. If the production of oil is more likely to greatly increase over the next 50 years, perhaps investors ought to be cautious about assets that require high oil prices to be economic. Most important… if we're not really going to run out of oil… perhaps we ought to be leery of corporations and their partners in government that want to tie us to energy products and policies that aren't in our ultimate best interests. We should be on guard for ideas that will handicap us with higher energy costs for the next several decades. Just imagine how the Germans and the Spanish will feel when they realize the PV solar panels from First Solar that they spent billions of dollars on don't work. Not only that, but the plummeting price of natural gas made them completely unnecessary. That's why M. King Hubbert's theory matters. And that's why I'm so passionate about these ideas. Thanks for your kind words about my writing. I've deleted much of the article you cited. But I do want to respond. I'd prefer in the future that you find a link and link to it in your comment. I've written about Porter Stansberry in the past, and he always uses the same canard. Those concerned about peak oil say that we are going to "run out". Of course, we never say that. We say that the rate of production is going to decline. Stansberry shows his hostility for every form of renewable energy whenever he writes and it makes me believe that he is nothing but a shill for the oil industry. The article you cite is virtually fact-free. And, he puts words in the mouths of those concerned about a near-term peak but cites no actual person who said them. I think he's just making it up! He creates pretend arguments that no serious person concerned about peak oil would make these days. He harps on M. King Hubbert, but is careful to avoid mentioning Ken Deffeyes, Jean Laherrere or Colin Campbell who significantly refined and expanded Hubbert's methods and provide a much more nuanced picture of the peak. And, Stansberry doesn't address the plateau in production which is now in its seventh year despite high prices. He tells us that high prices will solve the problem. But they haven't. Whom should we believe then? Someone who has been wrong seven years straight? Or the geologists who predicted that world oil supplies would likely stop growing around 2005? We might hit a nominal new peak in the future. But we now appear to be on a plateau in production. The big question is when we might fall off that plateau. I acknowledge the possibility that technological breakthroughs might increase the rate of production beyond the current plateau and even significantly and for an extended time. Anything is possible. The question is whether Stansberry's very poor record with regard to oil supply prediction ought to be the basis for our energy policy. There are lots of reasons for human societies to move beyond oil: pollution, climate change, geopolitical threats to supply. But an oil peak will trump them all if it comes soon. Stansberry's solution is for us to simply have faith. I for one do not recommend his faith-based energy policy to anyone based on the actual data and the tremendous risks we face if he's wrong. I found your blog via the Energy Bullentin. I read your previous post for the CSM and began to search for more of your commentary and stumbled upon your piece on the validity of counting NGLs/NGPLs as oil. After having read that last piece I was pretty amazing by your grasp of the technical aspects. The added benefit is that you're a gifted writer, so not only did you come across as knowledgeable (if not more) than some of the geologists on Peak Oil that I've read, you're mastery of the English language made it a pleasure to read. I've been following the Peak Oil story since about the year 2010, so all these names in the community I recognize, but many battles fought I do not. One such is the fight over the OPEC oil reserves. I've read about it but only in passing. I haven't come across as lucid (and well-sourced!) an explanation as yours. My somewhat prolonged point is that even if you, and other writers on this topic, may assume that everyone has all the details on this issue, a lot of people are starting to flood in these past 2-3 years as it's obvious that our economies do not grow fast enough and our generation, the young, are very environmentally aware. Therefore Peak Oil becomes a novel concept and many issues which many in the community may assume is a given, is in fact not as well understood by the newcomers like myself, as it is among the more experienced community members. Therefore I hope that you write about issues like these, which may seem esoteric in of themselves, but have a strong and valuable function to ground a lot of new, and younger, people who are just discovering the story. And your voice is needed, because you're a very intelligent man, and you're a great writer at that. If I could show my friends your reasoned writing on all the basic concepts on Peak Oil, instead of having them contend with the crazies like Kunstler or Ruppert, then they are going to have a much better understanding after having their intellectual thirst awakened by a mini-documentary or a brief conversation with someone who introduces them to the topic. Thank you for your kind words. The series I'm doing to introduce CS Monitor readers to my blog is designed to do just what you describe as necessary to introduce those who are delving into peak oil and related energy and environmental issues for the first time. I hope with this series and many future posts to continue to write in a way that is accessible to first-time readers while also providing longtime readers with a fresh angle or insight on our predicament. That will be quite a balancing act. But it is one way that I believe I'll be able to reach those who are just becoming aware of our situation and want to understand it better. 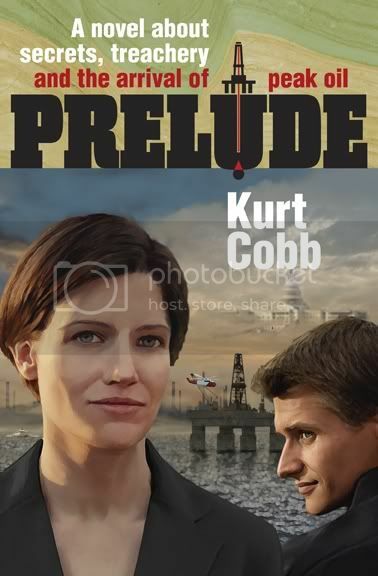 Another way I'm trying to reach those who are just becoming aware of peak oil and even those who know absolutely nothing about it is my novel, Prelude. My hope has been that activists would find the story compelling enough that they would recommend it to those they want to introduce to the topic. This is starting to happen, and I am hopeful that it will continue. Also, I am grateful to a newfound Hollywood contact who has produced a screenplay based on the book and is currently shopping it around to producers and directors who might be interested. Peak oil on the screen in the form of a romantic thriller could create a huge jump in awareness. Has America completely lied to itself in referring to the first oil shock as the "Arab embargo" ? - Producing countries wanting to get a bigger pie of each barrel revenues and start producing on their own. Then you had the raising reserves period within OPEC (and counter oil shock), which was about the OPEC internal rule of having the yearly quotas proportional to the reserves. Counter oil shock which was also about Reagan dealing with the Saudis for them to increase their prod and bring the USSR down, and it worked. Today what do you have ? Note : comment also posted at Energy bulletin.